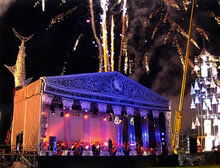 On 1st July 2000 a crowd of over 50,000 people packed into Oxford's South Park for the stunning finale to the city's Millennium festival. 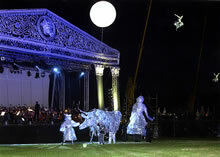 The event featured choreographed processions, breathtaking pyrotechnics, aerial artistry, the construction of 3 new spires for Oxford and the performance of the specially commissioned 'Symphony in Morris Minor' by Nick Bicât. The five processions led 3,000 participants through the city centre to South Park, which had come to life for the day with a Womad style food and crafts fair and performances by local bands, dancers and theatre groups. The stage for the main event had been decorated with miles of sticky tape in the style of the processional images carried by the crowds . The accompanying Open City festival across the city of Oxford featured over 60 events in unusual and historic buildings and natural spaces. Over 10,000 visitors enjoyed events as diverse as lunch at Christ Church and Africa week celebrations in the city centre.